The Performance Data Investigator is a browser-based graphical user interface for viewing and analyzing IBM i performance data. The Performance Data Investigator is a general name for the function; Investigate Data is the actual task name. 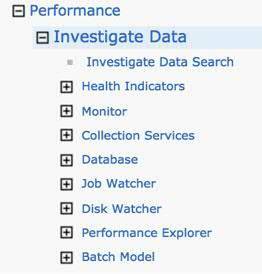 The Performance Data Investigator (PDI) is included with the IBM Navigator for i web console, which is part of the IBM i operating system. Everything you need to use this web console is installed by default (see “IBM Navigator for i” in the Resources section). The HTTP admin server is required, and it is automatically started. Simply point your browser at your IBM i partition, using the 2001 port (for example, http://<mysystem>:2001) where mysystem is the IBM i partition host name. You get a sign-on screen where you enter your IBM i user ID and password. After signing in, you can see the Welcome panel and the tasks available in the left navigation pane. In the left navigation pane, you can find the Performance tasks. Click the box to the left of Performance to expand the section and you will find the Investigate Data link. Click Investigate Data to open PDI in the main Navigator page, or you can expand the Investigate Data task and work with the PDI from the left navigation pane, as shown in Figure 3. Collection Services is a very efficient performance data collector that is intended to be run 24×7. You can control what data is collected. Collection Services is on by default, and IBM recommends that you do not disable or turn off Collection Services. See the Resources section for additional information. Job Watcher is a performance data collector that is intended to be run to collect more detailed job performance data for diagnostic purposes. Job Watcher collects much of the same data as Collection Services, but also collects more detailed information, such as call stacks and SQL statements. See the Resources section for additional information. Disk Watcher is a performance data collector that is intended to be run to collect detailed performance data for disk operations. Disk Watcher data can be useful for analyzing and optimizing application I/O. See the Resources section for additional information. Performance Explorer (PEX) is the performance data collector that is used when the most detailed performance data is required for problem determination purposes. PEX also has a mode, called profile, that allows application performance analysis. PDI only supports PEX profile collections. See the Resources section for additional information. 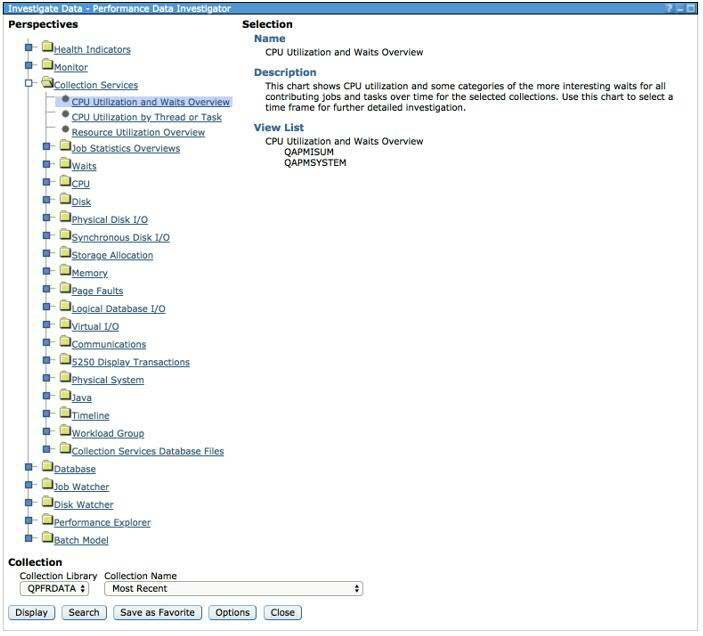 The Performance Data Investigator has different features available depending upon the Performance Tools options you have installed on your IBM i partition. The graphical user interface for Collection Services is included with the base operating system. However, the GUI for the other performance data collectors requires the appropriate option of the IBM Performance Tools Licensed Program Product to be installed. PDI has additional capabilities, such as working with Database performance data and the Batch Model tool. You must have the IBM Performance Tools Licensed Program Product, Manager feature, installed for these to be available. In addition to having the required options of the IBM Performance Tools Licensed Program Product installed, you also need to ensure that users of PDI without a powerful user profile (for example, *ALLOBJ users) are added to the QPMCCDATA authorization list. Use EDTAUTL QPMCCDATA to edit the authorization list to add users. The IBM i wait accounting technology can help in identifying reasons for issues (such as a record lock, object lock, disk I/O operation, journal operation, and so on) that result in a thread or task not using the processor. Because threads and tasks can wait for a wide variety of reasons, wait technology can be very useful in understanding the wait conditions and possibly eliminating or reducing wait time. Eliminating wait time can improve performance. Within the PDI, there are many charts that display wait information. Having a basic understanding of wait accounting helps you better understand those charts. See the Resources section for additional information. When you start the Investigate Data task, you will see a list of perspectives. A perspective is a chart or table of the performance data that is displayed. Perspectives are grouped into folders, and a collection of perspectives is called a content package. Each performance data collector has a content package. The content packages you see when you start the Investigate Data task depends upon the options (if any) of the IBM i Performance Tools licensed program product that you have installed (see the prerequisites discussed earlier). Figure 4 shows all of the possible content packages that are available. For the purposes of this article, the discussion centers around the Collection Services content package, because that is included with the operating system and does not require the Performance Tools licensed program product (LPP). To see the list of perspectives in a content package, you must click the folder icon in front of the content package name. It then expands to show a list of nested folders where perspectives are grouped by the type of performance data they display. Figure 5 displays the list of perspectives in the Collection Services content package. Within the Collection Services content package, the perspectives are organized by the type of data they display. 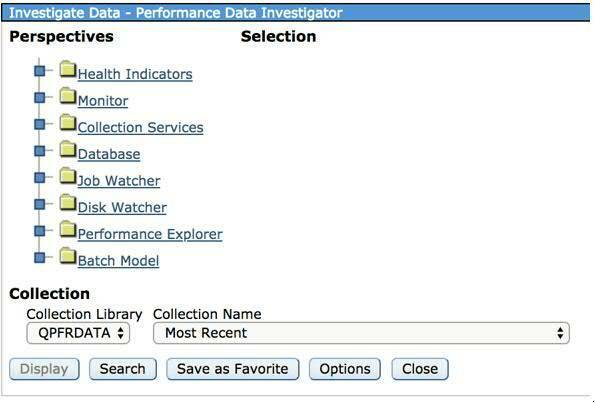 At the bottom of the Investigate Data panel is where you can specify the library in which the performance data resides and the name of the collection you want to investigate. The default library is QPFRDATA and the default collection is the most recent one, which allows you to look at the most recently collected performance data. The button on the main Investigate Data panel allows you to display the configuration options for the behavior of PDI. Most of the options are self-explanatory. However, Enable Design Mode deserves a brief mention. Design mode allows you to create your own content package and perspectives. The details of the design mode are far beyond the scope of this article. The Search button on the main Investigate Data8 panel allows you to access the metric finder to search for performance metrics and identify the charts, tables, or files in which the metric exists. While the metric finder remains available, the Investigate Data Search task is a superior search function. Investigate Data Search provides an interface where you can search on terms within all areas of PDI, providing a much more comprehensive search feature. Navigator for i has the ability to save favorites to make it easier to find the tasks you use most often. You can also save PDI perspectives as favorites. You do this from the main PDI window by clicking the Save as Favorite button. As noted earlier, you can also navigate to a perspective with Investigate Data in the left pane. If you navigate to various perspectives in the left pane, you are required to select the collection for each perspective you display. If you navigate to various perspectives in the main window, PDI remembers the collection you selected, and so you can move from chart to chart without changing the collection. Displaying performance data with PDI has many features for interacting with the displayed data, switching between chart and table views, data customization, and more. This section briefly reviews the main features of PDI when displaying performance data. A good starting point with Collection Services data is the CPU utilization and Waits Overview perspective. This chart shows the CPU utilization of the partition along with the wait information for the collection. This perspective can often give you a good idea of the timeframes you may want to consider for deeper analysis. This is the arrow icon and is used to select and deselect points in the chart. You can use the selection tool to identify start and end points to reduce the timeframe of the data you want to analyze. You can also select specific metrics that can influence the display of data in future drill-down selections. The pan tool is represented by the hand icon and allows you to pan through the data in the graph, moving left or right. This is the conversational bubble icon in the tool tray and allows you to turn on or off the fly- over information. Turning on tooltips allows you to instantly see some basic information about the metrics displayed in the chart as you move your cursor over the chart. This is the magnifying glass icon with a dotted box around it; the zoom region tool allows you to zoom in the chart to get a more detailed view of the data. This is the magnifying glass icon with the minus sign on it and provides the ability to step-wise zoom out. This is the cross inside a box icon and expands the chart to show the full timeframe of the collection. There are navigation shortcuts at the top of every perspective. The Perspective and Edit navigation shortcuts provide easy ways to access the GUI controls rather than having to scroll to the bottom of the chart to use the buttons for Done, Options, and Save As. In addition, the View option allows you to toggle on or off for additional information about the collection you are viewing. View -> Show Context shows basic information about the collection, while View -> Show System Information shows information about the system from which the collection originated. The History option displays the drill-down perspectives that have been used to get to the current perspective. In addition, the History option allows you to return to the Home page, which is a fast way to exit the main Investigate Data panel. In any perspective, you have drill-down options to go to other charts or tables for analysis purposes. In addition to the drill-down options, there are several additional functions found in the Select Action drop-down list. Export allows you to export the chart or table you are displaying for use with other applications, such as presentations, documents, or spreadsheets. Charts can be exported as images – PNG and JPEG are the supported formats for images. Table data can be exported in CSV or TXT formats. Every chart or table you display provides you the Modify SQL option. This option shows you the SQL statement behind the chart or table. You can then change this SQL statement to customize the query. Beware, this is not for a novice SQL user! Size Next Upgrade allows you to take the selected performance data and send it to the IBM Systems Workload Estimator (WLE) to perform a capacity planning exercise based on the data you have selected. It is important to select a beginning and ending interval for the data you want to send to WLE, otherwise the entire collection will be sent. Generally, you will want to identify a timeframe of peak workload activity for a sizing exercise, not a full 24-hour collection. Change Context allows you to modify the criteria for which the information is displayed in a chart – it is a nice way to limit the data that is used to build the chart. For example, if you were displaying a chart that graphed information about jobs, change context could be used to specify that only jobs with a particular name or user profile are displayed in the chart. Change Context also allows you to change the collection you are working with or change the timeframe you want to display. If you have changed a chart by using Change Context, you have the ability to save that changed chart in your own personal set of custom perspectives. Show as table Every chart can be displayed as a table. The Show as table option displays the data that is behind the chart in a table format. What’s nice about Show as table is that you can see all the data that was returned as a result of working with the performance data. In many cases, the table data has more columns of data available than what is displayed in the chart. You can search, eliminate some data, choose different sort criteria, and so on, when in table mode and then you can display the chart with the changes to the table data. This is another way to customize the information you display through PDI. If you have customized a chart by manipulating the table data, you have the ability to save that customized chart in your own personal set of custom perspectives. This article isn’t going to describe the table actions that are available to you in Navigator for i; the table actions when using PDI are the same as the table actions on any other table within Navigator for i. As mentioned in other sections, if you modify or customize a chart or table, you can save those changes to your own customized perspectives. When you save charts or tables after you have modified them, there will be a new content package on the main Investigate Data panel that starts with Custom Perspectives appended with your user profile name. This is where you will find all the customizations that you have done. You can use these customized charts and tables to view performance data from other collections as well. Navigator for i has a function called Set Target System. This allows the web infrastructure to support Navigator to run on one partition, but you can manage a second partition. This is a good option if you have a partition in which you cannot run a web server but wish to manage it with Navigator or use PDI to review performance data. The target system is accessed using the host servers. If you are managing the performance of a partition, there may be times when you want to review the same set of charts on a regular basis. You can do this manually, but the Performance Data Reports make it very easy to create reports that contain the required charts. The Performance Data Reports are found under All Tasks. You must first create a report definition that describes which charts you want to include in your report; IBM supplies some sample report definitions that you can start with. 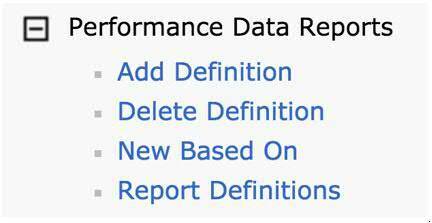 After setting up your report definition, you create your performance report using that definition. Your report can be generated as a PDF, a collection of images (JPEG and PNG), or as raw data (CSV or TXT). The PDF report is very useful for sharing the information with others. In the 7.3 release, IBM added support for historical performance data and the ability to review that data with the Graph History feature. The article Viewing historical data with Graph History reviews this feature. The Batch Model sizing tool, found under All Tasks, allows you to use Collection Services data to model the impact of hardware changes or workload growth. The article Creating a batch model reviews this feature. The Performance Data Investigator is a powerful tool for analyzing performance data. This article has just touched upon the major features of this graphical tool. As you use PDI, you can discover that it has a great deal of function and a lot of flexibility enabling you to view your performance data and proactively manage your system’s performance.